On Sunday, June 12, Omar Mateen opened fire in Pulse, a gay nightclub in Orlando, Florida, killing 49 people and injuring three others in what the New York Times has described as the deadliest mass shooting in U.S. history. Though the sudden devastation came as a shock to the world, many in the lesbian/gay/transsexual/bisexual/queer (LGTBQ) community saw it as a terrifyingly real expression of the challenges they face each day. “It’s a daily reality for so many of us,” said Adam Gonzales, a 27-year-old gay man living in Amarillo, Texas. Months before the shooting, Gonzales lay on the floor at CrossFit Amarillo, his chest heaving and head spinning in the aftermath of Open Workout 16.5. His boyfriend looked on from the sideline, pride etched on his face as high fives and fist bumps were passed all around. The final workout of Gonzales’ third CrossFit Games Open was cause for celebration. But first, Gonzales required a costume change. Taking care that he didn’t match his boyfriend’s outfit too closely, Gonzales swapped his bright-purple plastic-rimmed glasses for a more conservative pair in black. At the restaurant, the couple took care to leave several inches between them. In Texas, there are no statewide protections against employer discrimination based on sexual orientation, and as a teacher in a school district that has allegedly fired employees for their homosexuality, Gonzales’ partner needs to stay under the radar. “If word got back to his employer, he’d lose his job,” Gonzales said. Artist Karl Porter talks about how graffiti and CrossFit are healing wounds in the flashpoint city of Derry in Northern Ireland. Creative, dedicated CrossFit affiliate owners share how they’ve overcome obstacles including floods, angry neighbors and endless bureaucracy. 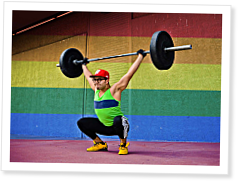 I am proud to be a part of CrossFit's inclusive community.